There are books and videos about how to make meetings more interesting and effective, but what about the rooms where meetings are held? Can anything be done to at least make the environment more acceptable? Perhaps more energizing and invigorating? Maybe even conducive to creativity? Many educational studies have shown that students are more alert and creative in bright, colorful classrooms. Office space designers are changing the way they plan new conference rooms, and we’re sharing some of them here, as well as some of the ideas we have seen help our customers. The first thing designers recommend is to determine the purpose of the room. Will it hold large meetings with everyone working together? Or will the room function better if it has the ability to be split into sections so small groups can work as teams? Will the room be used to make presentations to clients, with an audience on one side and a team of presenter on the other? Is one large table appropriate or several smaller tables that can be pushed together? Are meetings likely to long, which necessitate large, comfortable chairs? Short meetings can usually get by with smaller, less expensive chairs. If meetings will likely involve participants with laptop computers, make sure there are adequate power supplies. Lighting, colors, carpet, window treatments all combine to give a room balance and a feel. It’s a good idea to get professional help from an experienced decorator if it’s not your forte. One of the issues many people reported about meetings is that participants can’t see the speaker or the board, (or monitor) and they don’t have the ability to participate or respond as effectively as they wish they could. This is where one of our most popular products, Whiteboard in a Box, works very well in conference rooms. Office space planners are laying out more offices and conference rooms with large dry-erase surfaces so people aren’t searching for an available whiteboard. Almost everyone can relate to the experience of going into a conference room for a meeting and finding a single black marker. And it’s out of ink. Argh! Always make sure you have an ample supply of bright, colorful markers on hand. If you buy in bulk, you’ll save money. 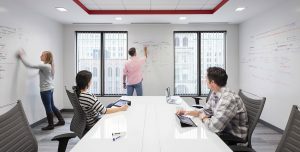 Finally, get input from employees before you plan a new conference room or a renovation. Two heads are better than one, and lots of opinions will help put together a room that will hopefully make meetings more enjoyable for everyone!